Some odd observations about Cantor's loss. In Virginia, anyone can vote in primaries, regardless of party affiliation. 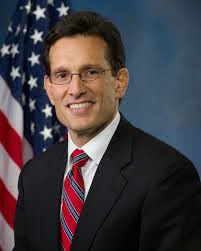 I am a Democrat who lives in the Seventh District, and I voted for David Brat as an anti-Eric Cantor vote. I know there were many Democrats who did the same thing. I don't know if people like us swung the vote or not, but we're happy he's out. Mr. Ansell seems content with the fact that Cantor has been punished; though he doesn't say so, he may believe that replacing Cantor with Brat, even though the latter is probably more intransigently reactionary, is a net gain. As another Times letter writer, Joan White, notes, "he will not have Mr. Cantor's power." The conventional wisdom is that the Seventh District is so deeply Republican that Brat is all but assured of victory in the general election. Josh Israel in Think Progress believes the race is "potentially competitive", based on polling that suggests a majority of residents of the district hold views on subjects like immigration that are different than Mr. Brat's. Still, another bit of conventional wisdom is that, in midterm elections, voter turnout is usually low and dominated by the voters who are angriest with the incumbent administration. So, while an upset by Brat's Democratic opponent, Jack Trammell,* isn't inconceivable, it's a very long shot and would almost certainly require an Herculean get-out-the-vote effort by the Democrats. But then, there's another intriguing bit of information I got from yesterday's Times op-ed column by Gail Collins, who often makes my day brighter. ** It seems that Cantor's attack ads against Brat called him a "liberal college professor." As an adjective, "liberal" seems to stick to "college professor" the way that "devout" does to "Catholic," or "hero" does to "cop" if you're a headline writer for a New York tabloid. Still, Milton Friedman was a college professor (OK, maybe he was the exception that proves the rule, whatever that means.) And Brat a liberal? Well, before I give Cantor four Pinocchios, I have to remember that he can plead the truth of his characterization, if only by referring to a definition of "liberal" that was current in the nineteenth century. That definition drew upon the etymological root of "liberal" which is shared with "liberty." The project of the nineteenth century liberals was to achieve what has come to be called "negative liberty": the freedom to conduct one's trade and one's life unfettered by the arbitrary power of the monarchy or hereditary aristocracy. This classic liberalism comes close to what is today called libertarianism. In today's usage, "liberal" as a political descriptor has taken on a second meaning of "liberal" as used in non-political discourse: "generous" or "munificent." (Here some of my Republican friends will want to add, "...with the taxpayers' money!" That leads to an argument we can have later. I'm working on a post that discusses how the meaning of "conservative" has changed as much, if not more, than has that of "liberal.") Today's liberalism embraces what has come to be called "positive liberty," as well as recognizing what it believes to be necessary limits on negative liberty. For more of my views on this subject, see "Genghis Kahn: the first liberal?" Anyway, Collins's column had me wondering how many people voted for Brat thinking he really is a liberal, in the contemporary sense. Well, maybe some of those Democrats who crossed over to vote in the GOP primary did. Brian Beuteler, in that reliable scourge of conventional wisdom The New Republic,*** writes that Cantor's loss is really no big deal. I was amused to see Cantor, in the photo above, wearing a Spitzer tie. Someday the word will get out that it's the cravat of political calamity. * Both Brat and Trammell are professors at Randolph-Macon College. Whatever happens in November, we know that Randy Mac will be represented in Congress. [W]e really do not need the Republicans in the House to become even more paranoid about a primary from the right. They’ve been nervous for a long time, but this is a whole new scenario. It’s the difference between worrying about burglars and hearing that a gopher in your neighbor’s backyard suddenly grew to be 6 feet long, broke down the door and ate all the furniture. ***Reliable, that is, until you get comfortable with the notion that conventional wisdom is usually wrong. Then TNR publishes a piece by Franklin Foer with the title "In Defense of Conventional Wisdom." 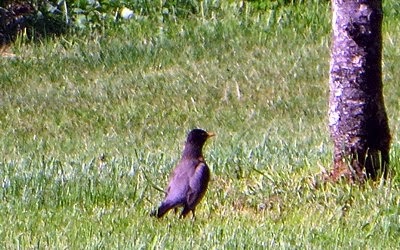 Walking around the grounds of the house where we spent Memorial Day weekend, I saw many kinds of birds. More often than not, my attempts to photograph them were frustrated by their flying off as I was lining up the shot and focusing. 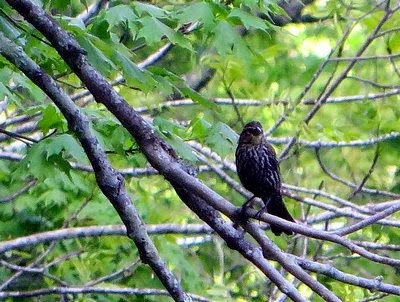 I was lucky to spot a female red-winged blackbird (Agelaius phoeniceus) perched on a branch. 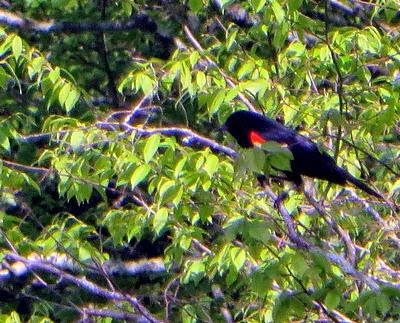 Some distance away, I saw the more colorful male, from which the species takes its name. 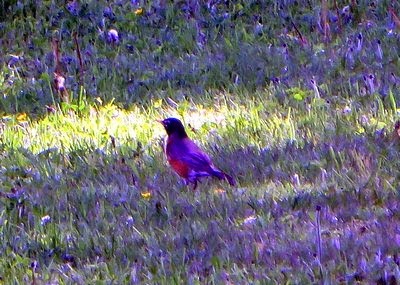 From this angle I'm not able to identify this bird: possibly an American robin (Turdus migratorius), or a yellow-billed cuckoo (Coccyzus americanus), or something else. Perhaps someone more experienced in bird lore can help. Update: John Hunt says it's a robin. This is certainly a robin. 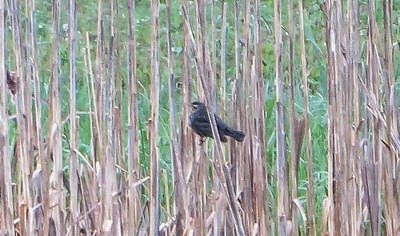 I wasn't sure, but John Hunt tells me this is probably another female red wing. 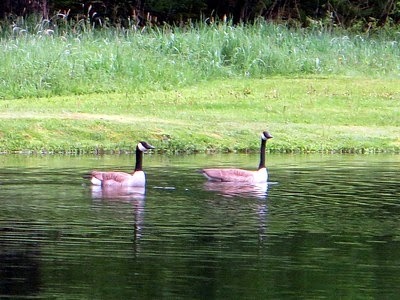 These Canada geese (Branta canadensis) were in my earlier post, but they bear repeating here. 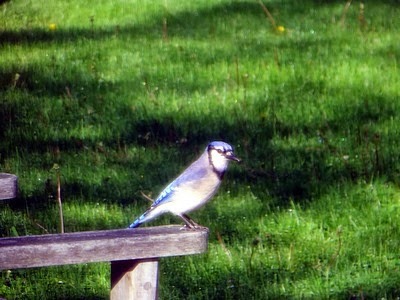 Shortly before our departure this blue jay (Cyanocitta cristata) alighted on the arm of a patio chair. 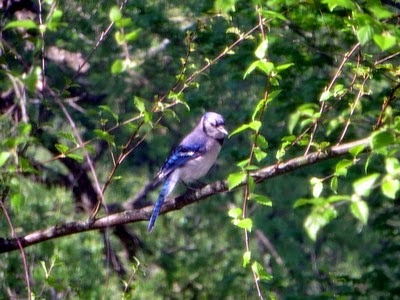 A few minutes later I got this photo of the jay in a more natural setting. 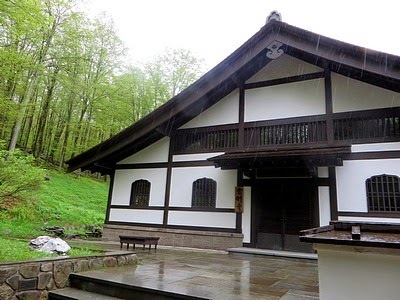 During our Memorial day weekend visit to the Beaverkill Valley our hostess suggested a tour of the International Dai Bosatsu Zendo Kongo-ji, located a few miles from the house where we were staying. She phoned, and was told we would be welcome. On a rainy afternoon we rode along a two lane road that followed the course of the Beaverkill for several miles, then turned off onto a narrower, rougher road. We were on this for some time and our hostess, who was driving, thought we had missed the entrance. A short way further we came to a large Japanese style arched entrance way spanning a two rut dirt road. If the approach to the entrance gate seemed long, the driveway seemed interminable. At last we saw a pond ahead of us, the road curved to the left, and on a hillside ahead was the monastery (photo above). We went in, removed our shoes and, as instructed, rang the bong twice. Within moments we were greeted by a woman resident, who made us feel welcome and at ease. This magnificent Buddha figure sits in the hon-do, or main hall, on a dais flanked by paintings of guardians. Below are photographs of people who have been associated with the monastery. 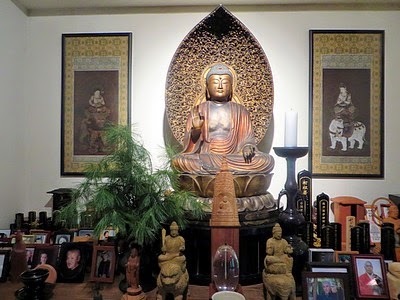 Immediately to the right of the small guardian figurine near the bottom right of the photo above is a photograph of the late Peter Matthiessen, writer, naturalist, frequent visitor to Dai Bosatsu Zendo, and uncle as well as namesake of Peter M. Wheelwright, author of As It Is On Earth. 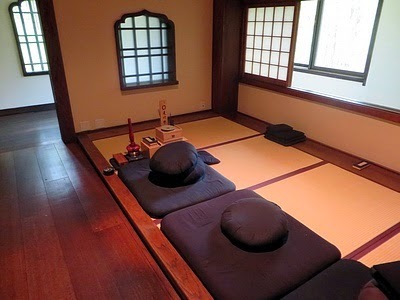 This is the zen-do, the room in which residents and visitors practice zazen, or Zen meditation. Some use one cushion; others prefer two. 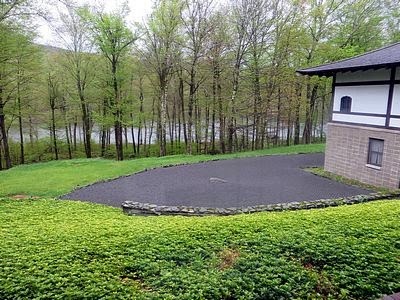 Just beyond the zen-do there was a view from a window of a Japanese rock or dry garden, sometimes called a Zen garden. What is Zen? It's easiest to say what it is not. It's not a religion. It is a practice involving disciplined meditation that is intended to lead to self realization. It is non-theistic, but neither atheistic nor anti-theistic. I have known Christians and Jews who practice Zen, including one who is both Roman Catholic and a Republican. On our way out, we stopped in the monastery's gift shop, and I bought a copy of Zen Flesh Zen Bones: A Collection of Zen and Pre-Zen Writings, compiled by Paul Reps and Nyogen Senzaki. The sixteenth of the "101 Zen Stories" that begin the book is about a student who visited the Zen master Gasan and asked if he had read the Christian Bible. Gasan said no, and asked the student to read to him. The student opened the Bible and read from St. Matthew: "And why take ye thought for raiment? Consider the lilies of the field, how they grow. They toil not, neither do they spin, and yet I say unto you that even Solomon in his glory was not arrayed as one of these....Take therefore no thought for the morrow, for the morrow shall take thought for the things of itself." Gasan said: "Whoever uttered those words I consider an enlightened man." 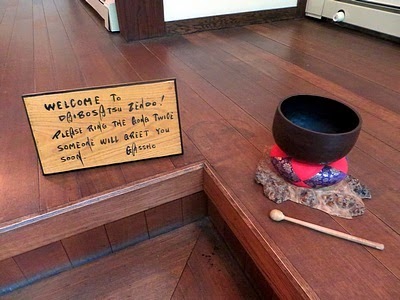 While Zen is associated with Buddhism, its practitioners do not necessarily consider themselves Buddhists. According to the foreword to the 101 Zen Stories, early Zen masters "instead of being followers of the Buddha, aspire[d] to be his friends and to place themselves in the same responsive relationship with the universe as did Buddha and Jesus." As Reps points out in the preface to the book, the origins of Zen may pre-date the Buddha's life. The book includes "Centering, a transcription of ancient Sanskrit manuscripts" that "presents an ancient teaching, still alive in Kashmir and parts of India after four thousand years, that may well be the roots of Zen." I can add that "centering prayer" is a discipline taught and practiced at my own Grace Church in Brooklyn Heights.